If you’re stressed out and frustrated with the ever-more-expensive/crowded/homogenized/frantic urban lifestyle, but you can’t really see yourself in–let alone afford, these days–suburbia, playwright/performer Ethan Lipton has a quaint piece of property to recommend. It’s far enough away to be affordable (which, sure, means there aren’t really any jobs), it’s got tons of charm, and in the local mix of “early settlers” and “late arrivals” (let’s not talk about the “weekenders”), you’re sure to find some new friends. And the views are amazing. There’s just one teeny tiny thing you need to consider: you’re not buying a charming old Queen Anne house in some lovely not-quite-discovered farm county up the Hudson River (though the parallels are striking)–you’re heading out toward the planet Mercury with your spouse and dogs and cat, to join an orbiting colony of Earth exiles and the occasional honest-to-god-from-another-planet alien. A sequel to Lipton’s 2012 solo musical No Place to Go–performed, like the first, by Lipton, backed by his Orchestra (Vito Dieterle, Eden Levy, and Ian M. Riggs), at Joe’s Pub and directed by Leigh Silverman–The Outer Space charts the continuing adventures of our hapless, nameless protagonist and his wife (and their pets). When we saw him last, he was grappling with the conflict between pragmatism and artistic dreams, trying to figure out how to make–and afford–an authentic life in a world where art and individuality were constantly squeezed by the imperatives of survival, and a modicum of success at a career you never wanted threatens to compromise all your ideals. Now, the marriage has been strained by a new conundrum: the wife wants to get away from it all–and by all, she means everything that makes Earth Earth: everything from noise, violence, and oppression down to “overhyped pastries and busker rock.” The husband, on the other hand, has always been the guy who wants to get to it all, who’s afraid of showing up too late and missing all the good snacks. But, being a man whose plans and opinions are always less definitive than his wife’s, he goes along with the plan to scrounge every penny they can, buy a jalopy of a spaceship, and shoot off for a new life in space. This piece is a bit more polished than No Place to Go, both visually–helped by David Zinn’s elegantly economical set of lit terrariums and Ben Stanton’s whimsical lighting effects–and narratively. Lipton, as both writer and performer, still makes an excellent everyman, with nerdy honesty, gently acerbic wit, and sweetly sincere enthusiasms. I admire, too, his forthrightness about money issues and the way they’re woven into everything; you don’t usually find fits of panic about affording a new roof (for a spaceship) in a cabaret musical, and it’s a welcome addition. The band is versatile and the songs well-crafted, drawing on elements of different American musical traditions–a dash of folk song, a bluesy riff, a charming, silly ditty. But polish has also smoothed off a few of Lipton’s spikier edges and more pointed critiques. Perhaps the targets in space are fewer (certainly farther between, anyway). It’s harder to get biting satire out of earnestly eclectic space hippies than out of bureaucracy and global (interstellar) capitalism. 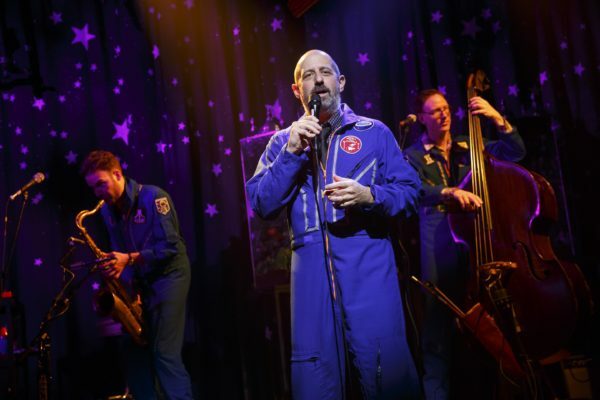 The show is charming and genuinely funny–the riffs on what dogs, cats, and space beavers think of life orbiting Mercury are quite brilliant, just for one example–but the commentary hits less hard. Our hero becomes a man who learns how to find inner peace, who learns how to be in the present until that starts to feel like home. It’s a hopeful, optimistic message–and one that feels a little oversimple. Perhaps I need to take a few lessons from Lipton and learn to see the yoga in everything (Wearing groovy pants? That’s yoga. Following the trends? Not yoga. ), step into the moment, and breathe.